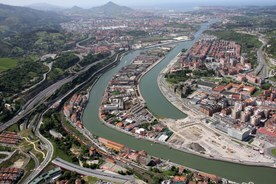 Bilbao’s ‘Zorrotzaurre’ district is currently a degraded, flood-prone industrial peninsula. With increasing extreme precipitation predicted across the Basque country in the future due to climate change and a need for new housing to accommodate citizens of Bilbao, a major urban regeneration project is currently underway to redevelop Zorrotzaurre district into a new flood-proof residential quarter. 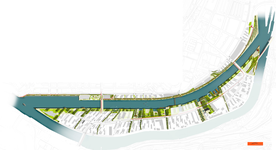 Flood protection includes five key measures: (1) opening the Deusto canal (turning the peninsula into an island), (2) providing a flood protection wall, (3) elevating the ground level by 1,5 meters for new buildings, (4) installing storm water tanks and (5) providing green, public spaces. To realise this urban regeneration project, a public-private partnership was established for financing and managing the plan. The costs for the redevelopment works will be covered by the public-private partnership, i.e. the owners of the land, according to their share of ownership. Bilbao is situated in the Nerbioi valley through which the Nerbioi River flows, influenced by ocean tides. Today, river flooding is already the most common threat in the valley caused mainly by increased runoff due to land cover changes related to inadequate forest management, intensive cattle raising and recreational practices, as well as by Bilbao’s urban sprawl. Costs incurred by Bilbao’s metropolitan area associated with river flood events have been estimated at €5.5 million for a once in 10 year rainfall event (T=10), €241 million for a once in 100 year event (T=100), and €444 million for a once in 500 year rainfall event (T=500) (lower range of estimates). Based on regional climate models predicting a 10% increase in extreme precipitation events across the Basque Country, the threat of flooding will likely increase in the future. It is also estimated that the peak flow of the Nerbioi River in 2050 will have risen by 22%, which in turn could mean that the area at risk of flooding may expand by 3%. While this figure sounds minor, it can have disastrous effects on houses, industrial areas and agricultural land in the area concerned. In addition, a rising sea level accompanied by higher tides will aggravate the flooding potential along the estuary. Consequently, taking climate change into account, the expected damage costs incurred by the heightened flood risk of Bilbao’s metropolitan area may rise by 56.4% compared to the current estimates listed above. More generally, Bilbao is a city with a thriving economy and an expanding service sector. As a consequence, the city faces a high demand for new housing units and related infrastructures. As Bilbao is located in a valley, it has little space to expand and solutions must be found within the current built environment. Zorrotzaurre, an abandoned industrial peninsula situated in the Nerbioi River, therefore provides an interesting opportunity and its development plan includes the construction of 5.473 new dwellings and 202.129 square meters of construction for economic activity (25% of the total surface area). The objective of the redevelopment project is to turn Zorrotzaurre from an industrial site to a residential area. This first and foremost requires adequate protection from flooding. Objectives with regards to flooding have been defined as: existing houses in Zorrotzaurre should be well protected for T=100 rainfall events: new buildings/housing should withstand T=500 events. Opening up the Deusto canal. The opening of the canal reduces the flood potential by creating increased water capacity and thereby decreasing the height of the water surface. Studies show that the opening of the canal greatly reduces the risk of flooding in Zorrotzaurre as well as other urban areas (e.g. Botika Vieja, Euskalduna, Abandoibarra, and Campo Volantín) including the historic centre of Bilbao higher upstream. With this adaptation measure in place, decreases of flood levels between 1 and 0.5 meter can be achieved. Similarly, the Research Center for Climate Change, BC3, has conducted a study concluding that the opening of the canal would generate a considerable reduction in the expected economic damage from flooding events in Bilbao (see ‘costs and benefits’). It should also be noted that the opening of the canal will turn the peninsula into an island. Elevation of the ground level. During the first phase of the project the surface in the east and west of the Zorrotzaurre peninsula/island will be elevated by 1.5 meters so that new buildings can be constructed on a higher level. This should protect the new buildings from T=500 rainfall events. Construction of a flood protection wall. To protect the 47 existing buildings (including 352 apartments) on the peninsula, mostly locat-ed next to the river, a 1 meter high flood protection barrier will be constructed. This barrier should ensure that existing buildings are protected from flooding from T=100 rainfall events. Green, open spaces. The 7.5 km long river bank will mostly (95%) be 20 meter wide public space for pedestrians and bikers, partly at the current level and partly at the elevated level. Some of this area can be used as an overflow area for the river. The green open spaces are concentrated on both edges of the island and on the canal side, with major walkways on both banks of the canal, as well as a linear park of 40,000 square meters in the central area of the island. The gardens of Botica Vieja on the opposite side of the canal will be extended and increased in size and con-nected by the new bridges to the open spaces on the Zorrotzaurre island. The network is complemented with “green fingers” of more than 5.000 square meters extending across the island from the canal to the pathway located on the riverbank. Provision of storm water tanks. In addition to the measures above, 3 storm water tanks will be provided to store excess water, one in San Ignacio (620 cubic meters) and two in Ribera de Duesto (2.100 cubic meters each) (two neighbourhoods on the other side of the canal). The main stakeholders of the redevelopment project, the land owners of Zorrotzaurre, created the public-private partnership, the ’Comisión Gestora de Zorrotzaurre’ (the Management Commission of Zorrotzaurre) as a necessary element to advance the project. The private sector initiated the partnership, and, due to the importance of the project and the amount of land owned by public authorities (Port, City and Province), the public sector joined the ‘Comisión Gestora’. The ‘Comisión Gestora’ is a union of owners with no special legal status. The ‘Junta de Concertación’, the organization that was created to develop the first phase of the project, is an organisation defined in the Basque law for urbanism. Both are not-for-profit, since the final objective is to balance the costs with investments made by the owners. The current members of the ’Comisión Gestora de Zorrotzaurre’ own 65% of the land in Zorrotzaurre; these are: The Regional Basque Government (through the Department of Employment and Social Affairs and the publicly-owned company Visesa), Bilbao City Council, the Port Authority of Bilbao, and private entities ‘Sociedad Promotora Inmobiliaria Margen Derecha S.A.’ and ‘Vicinay Cadenas S.A.’. The ’Comisión Gestora de Zorrotzaurre’ supervises the redevelopment plan of Zorrotzaurre (the ‘Master Plan Zorrotzaurre’) and the members pay for all the expenses of the project and contribute financially relative to the share of land they own (51% public, 49% private). The residents of Zorrotzaurre are excluded from membership as they are not supposed to pay for any costs of the project. However, they, together with the neighbourhood association, have been involved in the design and development of the plans for which various interactions with the project managers have taken place. Among the results of these discussion has been a programme established by the ‘Society for Municipal Restoration’, or Surbisa, with a ring-fenced budget (donated 50% by developers of the general project and 50% by the municipality) to support and help existing owners and tenants to restore their buildings with special attention to improve accessibility and energy saving. Surbisa is a municipal company, owned 100% by the City. The Boards consists of all parties that have an elected member in the City. In addition, the redevelopment plan has had two periods of public exposure where 38 and 10 claims respectively were received from citizens of Bilbao. As a result of the claims, a number of modifications were introduced into the initial planning approach, some of a minor nature and others more fundamental, like the decision to maintain the former industrial building known as the ‘Papelera’, which is located on the Deusto riverbank. Citizens wanted to maintain this historic building and it will now be converted into a cultural centre. The great number of stakeholders involved, including the municipality, land owners and residents. Soil pollution: because of previous industrial activities, the soil in some areas is polluted and will need to be decontaminated before construction work can start (this is being paid by the companies that caused it, or by the current land owners if the former do not exist anymore). Moving industries: the plan also involves the demolishment of several buildings and the relocation of 30 companies to other locations outside of Zorrotzaurre. For this, a special plan and a sub-project have been created, the so-called ‘Re-Allotment project’, which also consisted of gathering funds within the ’Comisión Gestora de Zorrotzaurre’ to compensate the parties involved. The compensation and ample preparation time for the relocation meant that very few problems have been encountered in the end with the parties concerned. On the other hand, one of the greatest assets to the project is the investment vehicle that has been concluded: the great number of land owners of all sizes gathered in the public-private partnership (the ’Comisión Gestora de Zorrotzaurre’). The partnership includes a Coordination Board and a Management Board, which oversees the execution of the works and facilitates the coordination and operation of the project. The costs for opening the Deusto canal are budgeted at €20.9 million. The City Council takes up this spending as they reached an agreement with the Basque government that the Basque country in turn will finance the costs of one of the new bridges. The municipality will also pay for the flood protection barrier (€5.1 million, including the structural rehabilitation of the river bank) and the storm water tanks (costs estimated at €4.74 million), as agreed between the municipality and the ‘Comisión Gestora de Zorrotzaurre’. The costs for the ground level elevation and public, green spaces (as well as the other redevelopment costs) are paid by the ’Comisión Gestora de Zorrotzaurre’, the public-private partnership that has been erected for the redevelopment of Zorrotzaurre. All flood protection solutions together have been estimated to: (i) eliminate the damage costs associated with T=10 rainfall events; and (ii) reduce damage costs for T=100 and T=500 events by about 67% and 30% respectively. The ‘Master Plan for Urban Planning in Bilbao’, approved in 1995 (and being updated in 2016), includes the land use change of Zorrotzaurre from industrial to residential, with 50% social housing and ample public facilities (cultural, educational, recreational). The corresponding ‘Master Plan for Zorrotzaurre’ for the project was drawn up in 2004, revised in 2007, and designed by the prestigious architect Zaha Hadid . On November 29th 2012, the Bilbao City Council gave definitive approval to the ‘Master Plan for Zorrotzaurre’. The City of Bilbao is responsible for the implementation and maintenance of the measures. The ‘Comisión Gestora de Zorrotzaurre’ is a private organization, involving public and private owners of the land on Zorrotzaurre. The task of the ’Comisión Gestora de Zorrotzaurre’ is to make the decisions necessary to advance the work and achieve the plan’s objectives, as well as to resolve problems that may arise during the implementation. The executive decisions are taken by the members of the organization’s Management Board, who are representatives, at the highest level, of the property owners. The Coordination Board, on the other hand, is responsible for the daily operations and it regularly reports to the Management Board. The adaptation objectives of the ‘Master Plan Zorrotzaurre’ are backed by the national and regional adaptation strategies. The Ministry for the Environment of the Government of Spain issued a ‘Spanish Strategy for Climate Change and Clean Energy’ 2007 laying out its plans until 2020. The Basque Country has followed and in 2015 adopted the ‘Basque Climate Change Strategy 2050’. Whilst the implications of the latter for the Basque municipalities are yet to be seen, both strategies provide an incentive to do more at local level to prevent impacts from climate change. The bridge over the canal has been constructed (2016) and work on the opening of the canal is expected to be completed by the end of 2017. The urban redevelopment of the island will commence in 2017 and is not expected to be finished within 30 years. The flood protection measures are expected to last the lifetime of the buildings.